SHS-AdC (Sacred Heart School-Ateneo de Cebu) beats UV (University of the Visayas) to take a commanding 2-1 lead in CESAFI juniors basketball finals series. THE moment when he was needed the most, Jair Igna stepped up from a scoring slump with an amazing fourth-quarter performance and a crucial three-point play to guide the Sacred Heart School-Ateneo de Cebu (SHS-AdC) Magis Eagles to a crucial victory and a 2-1 lead in the 11th Cebu Schools Athletic Foundation Inc. high school championship series last night at the Cebu Coliseum. Following a dismal scoring performance in Game 2, posting just two points, it seemed as if Igna was in for another bad night. However, after three scoreless quarters Igna exploded for 15 points and made a crucial three-point play to a 73-69 victory over the University of the Visayas (UV) Baby Green Lancers. UV had a three-point advantage, 49-46, going into the fourth quarter but SHS-AdC regained the lead in the 6:52 mark after Igna sank a three pointer to make it 56-54. Nelson Peralta tied the game at 65 with 2:03 left with a shot beyond the arc before Dawn Ochea scored back-to-back baskets for a 69-65 cushion. Peralta could have trim the lead but he missed both his free throws with 1:10 left. Mathew Oche grabbed the rebound and Andres Desiderio was fouled. However, he made just hit one charity to make it 66-69. With 25.4 seconds left, Henry Asilum turned the ball over with an errant pass to Julius Cadavis. UV failed to capitalize on the other end after Dexter Lucero launched a hurried three-pointer, which could have tied the game. Ochea was fouled by Desiderio and was sent to the line but only hit one of two for a 70-66 lead with 17 ticks left. Ron Dennison then hit a crucial three-point shot in the final 9.3 seconds to make it a one-point ballgame. UV opted not to foul immediately but Peralta was forced to foul a running Igna, who hit his layup and the bonus basket with 2.8 seconds to seal the game. Ochea had his best game in the championship series with 17 points, while Asilum added 15. 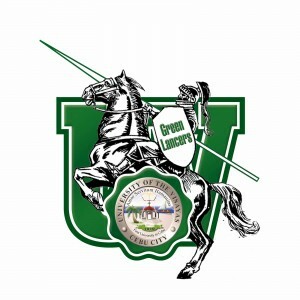 Lucero led the Baby Green Lancers with 17, while Desiderio added 16. 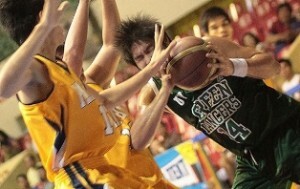 UC Webmasters wins Game 2 in CESAFI Finals. 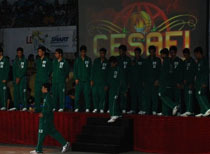 They lead the series 2-0 and only one win away to bag the back-to-back CESAFI Title. THE University of Cebu (UC) Webmasters are a game short of retaining their collegiate division crown of the Cebu Schools Athletic Foundation Inc. (Cesafi) after escaping with a 91-84 overtime thriller over the Southwestern University (SWU) Cobras in Game 2 of the best-of-five championship series the other night at the Cebu Coliseum. UC now leads the series, 2-0, and is a game away from winning back-to-back collegiate division titles in the Cesafi basketball tournament. The Webmasters were ahead in the first three quarters but SWU’s Joseph Nalos, Justin Aboude and Bonifacio Guillena sparked a 15-4 run to take the lead, 68-66, in the 4:48 mark of the fourth quarter. UC’s behemoth center June Mar Fajardo tied the game at 68 with a basket down low but Nalos sank a three-pointer and shot a fast break layup for SWU to build a 73-68 cushion. Luigi Bercede trimmed the lead down to 70-73 with a drive in the final 2:40. SWU’s Rene Pacquiao answered with a shot from the other end for a 75-70 lead. Brian Heruela immediately retaliated with a layup to cut it down, 72-75. SWU made two crucial mistakes with less than two minutes on the clock. 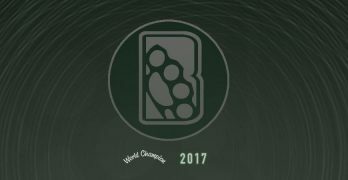 Aboude was called for a travelling violation and the Cobras were called for a 24-second violation in the other possession. Fajardo made it a one-point ball game, 74-75, after scoring two points with 48 ticks left. SWU’s Eleazar Armecin could have given SWU a three-point lead but he missed his shot. UC’s Robinson Mohammad tried to seal the game with a three-pointer, he missed his target but the ball luckily went to the hands of Bercede, who was fouled. Bercede could have closed the game from the freethrow line but he only shot one of his charities to send the game to overtime. UC immediately dictated the pace at the start of overtime and scored six unanswered points from Fajardo and Mohammad for an 81-75 lead. Aboude forced Fajardo to absorb his fourth personal foul after scoring with a strong move down the painted area to make it 81-77. 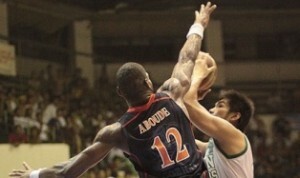 Aboude, however, missed his bonus free throw and fouled out of the game in the 3:01 mark. UC then sealed the game after another six-point rally for a 10-point lead, with just two minutes left on the clock. Fajardo led UC with 23 points, while Mohammad and Bercede added 17 and 15 points respectively. Nalos scored a game high of 26 points, while Pacquiao and Aboude also were in double figures with 18 and 15, respectively. Game 3 of the collegiate division championship between UC and SWU is scheduled tomorrow night at 6:45. Before that is also Game 3 of the high school division between the Sacred Heart School-Ateneo de Cebu Magis Eagles and the University of the Visayas Baby Green Lancers. 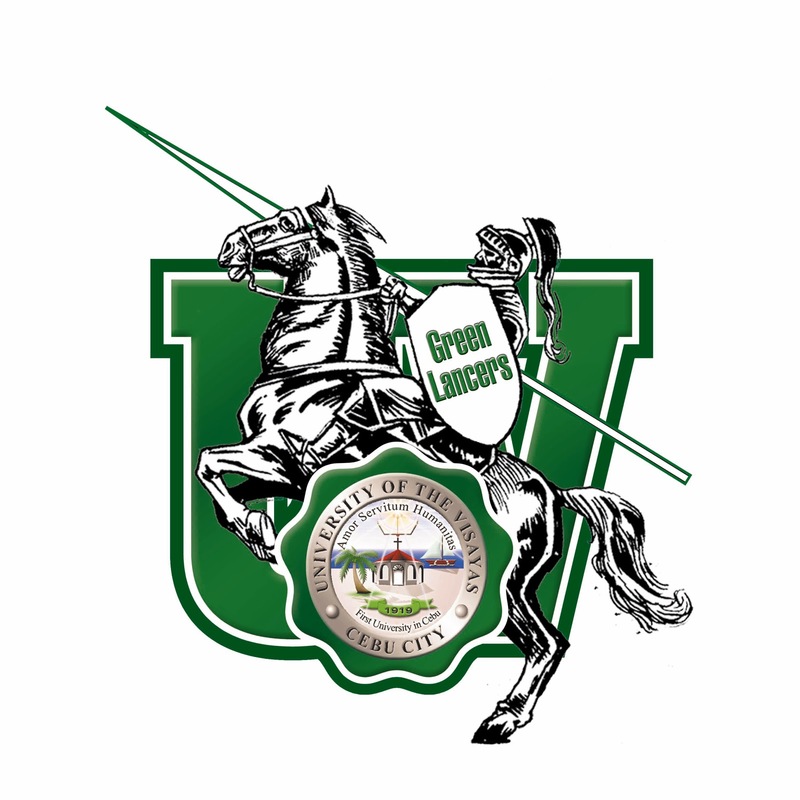 UV Green Lancers dumps USPF Panthers 70-58. The UV Green Lancers closed their campaign with a high note dumping the Panthers in last Tuesday’s game of the 11th Cebu Schools Athletic Foundation, Inc. (CESAFI) basketball season at the Cebu Coliseum. The Lancers improved their win-loss card to 9-3. However they will await the outcome of the game between0 top seed defending Champion UC and Southwestern University (SWU) Cobras to finalize their ranks in the standings. A win by Webmasters will solidify the Lancers second seed and gain twice-to-beat advantage. But if SWU Cobras will win, Lancers will slide down to third seed. For the first time, UV hopefuls are rooting for the Webmasters to beat the Cobras in order to get the twice-to-beat advantage going into the semi-final round. The Lancers step on the gas in the fourth quarter and controlled the game. From there the Lancers did not look back and seal the victory. They lead as much as 16 points. Big man, Edrian Lao lead the way for the Lancers scoring 19 points while rookies Perolino and Junnard Premacio added 14 and 12 points, respectively.